Waste water is a byproduct of domestic, industrial, commercial or agricultural activities. 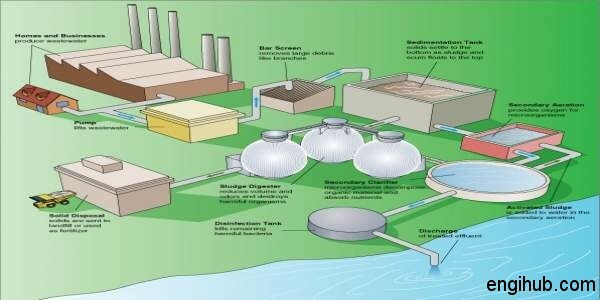 A wastewater contains a large number of physical, chemical and biological pollutants at varying concentration levels. Treated wastewater can also be reused for various purposes. In waste water engineering, some particular words are used. Before knowing more about the sewage treatment procedure, the concern people must have the basic details in this field. So, the Domestic waste water is 99.9% water and 0.1% solids. When the pH of the raw wastewater is 8.0, it means that the waste water is alkaline. So, if waste water has a pH value of 6.5, it means that it is acidic. It is the waste water before treatment. The Solids which cannot be removed by filtering are known as dissolved solids. It is the mixture of activated sludge, wastewater and oxygen, wherein biological assimilation occurs. It refers to a brownish flocculent culture of organisms developed in aeration tanks under controlled conditions. It is also Sludge flock produced in raw or settled wastewater by the growth of Zoological bacteria and other organisms in the presence of dissolved oxygen. It is the Clumps of bacteria and particles that have come together to form clusters or small gelatinous masses. It is a process where colloids come out of suspension in the form of flock or flakes. Bacteria are microscopic living organisms. So, they are a group of universally distributed, rigid, essentially unicellular, microscopic organisms lacking chlorophyll. So, to measure the strength of wastewater the BOD test is used. The BOD of wastewater determines the milligrams per liter of oxygen required during stabilization of decomposable organic matter by aerobic bacteria action. Also, the total milligrams of oxygen required over a five-day test period to biologically assimilate the organic contaminants in one liter of waste water maintained at 20 degrees Centigrade. It is the milligram quantity of oxygen required to chemically oxidize the organic contaminants in one liter of wastewater. It is the biological decomposition of organic matter in sludge resulting in partial gasification, liquefaction, and mineralization of putrefaction and offensive solids. Anaerobic digestion is a bacterial process that is carried out in the absence of oxygen. Hence under aerobic conditions, bacteria rapidly consume organic matter and convert it into carbon dioxide. It is the tendency for particles in suspension or molecules in solution to settle out of the fluid in which they are entrained and come to rest against a wall.